The Justice Department says that special counsel Robert Mueller’s investigation did not find evidence that Trump’s campaign “conspired or coordinated” with Russia to influence the 2016 presidential election. In a four-page letter to Congress, Attorney General William Barr quoted Mueller’s report as stating it “does not exonerate” the president on obstruction. Instead, Barr said, it “sets out evidence on both sides of the question.” Barr then decided there was insufficient evidence Trump obstructed justice by trying to interfere with Mueller’s probe. Congressional Democrats say they want access to all of Mueller’s findings — and his supporting evidence. 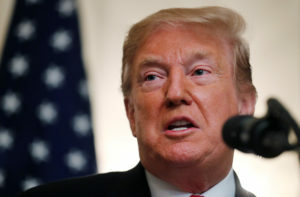 After the release of Barr’s letter summarizing Mueller’s findings, the president and fellow Republicans cheered the conclusion of no conspiracy or coordination while Democrats pointed to the question of obstruction and Mueller’s report that pointedly did not exonerate Trump. Trump said the release of Mueller’s full report “wouldn’t bother me at all.” Democrats quickly put that statement to the test, demanding that his administration hand over the entire document and not just the four-page summary from Barr. After a series of strategy meetings, Democrats vowed to continue their multiple investigations into Trump. As for Republicans, Trump aides and political allies developed a plan to turn the end of the probe into the launching pad for a new round of attacks on the president’s foes and a moment to reinvigorate his supporters in the run-up to the 2020 campaign.